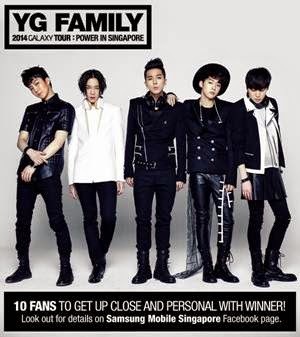 Singapore, 11 September 2014 – Samsung proudly presents the first-ever YG Family Concert in Singapore – YG Family 2014 GALAXY Tour: POWER in Singapore – on 13 and 14 September at the Singapore Indoor Stadium. To reward customers in Singapore, Samsung has lined up a series of pre-concert and on-site activities for customers and fans to score the ultimate YG experience, headlined by some of the hottest names in the K-pop industry: BIGBANG, PSY, 2NE1, Epik High, and YG Entertainment’s highly anticipated new boy band, WINNER. By participating in these activities, Samsung customers will stand a chance to win concert tickets, rehearsal tickets and other limited edition gifts. “The success of the YG artistes is proof of their hard work to pursue their passion and excellence in music and entertainment. We are proud to bring this philosophy to life by presenting the YG Family 2014 GALAXY Tour: POWER in Singapore concert, and hope to encourage youth to similarly express their originality and creativity in their pursuit of excellence,” said Stanley Goh, Vice President, Marketing, Samsung Electronics Singapore. Singapore is the only Southeast Asia stop where the YG family will be touring and fans from around the region – Malaysia, Thailand, Philippines and Indonesia – are expected to join in this major extravaganza. Fans can expect solo and group performances as well as collaboration across the YG artiste groups at the concert, which has been hyped up to be the biggest and most powerful Hallyu performance platform of 2014. To reward customers, Samsung has organised pre-concert and on-site activities that will allow Samsung customers and fans to get up close and personal with the YG artistes. Head to the Samsung Experience Store at Westgate at 11am on 14 September for a fan meet with YG’s most anticipated new boy band, WINNER! Ten fans will be able to get up close and personal with WINNER, and receive autographed memorabilia. Look out for the recruitment post on the Samsung Mobile Singapore Facebook page, at www.facebook.com/samsungmobilesingapore. Get ready for the ultimate YG experience by visiting the Samsung GALAXY Studio Power Station! Held at the Singapore Indoor Stadium from 11am on concert days, 13 and 14 September, fans have the opportunity to receive exclusive YG Family memorabilia, while experiencing first-hand the features of the latest Samsung products. For more information, please refer to appended key activity highlights or visit Samsung Mobile Singapore’s Facebook page www.facebook.com/samsungmobilesingapore.